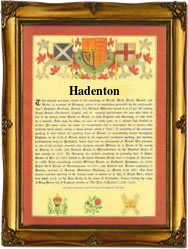 Recorded as Hadenton, Haddington, Hadinton, Haddinton, Hodinton, and possibly others, this is an English locational surname. It originates from the village of Haddington in the county of Lincolnshire, and was first recorded in the famous Domesday Book of 1086 as Hadintune. According to the Oxford Dictionary of English Place Names it means "The place (tun) of the Haeda people", a clan who were prominent in much of the east of the country for many centuries, and who also appear in place names such as Haddiscoe in Norfolk, and Haddenham in Berkshire. "Locational" surnames are often "from" names. That is to say names given to people after they left their original villages to move somewhere else. Somewhere else could be the next village, but often was far away which is why many surnames occur in the city of London, but are not even found in their own original locality. In this case whilst the surname is rare in Lincolnshire we did find the recording of Samuell Haddington, whose son John was christened at Gainsborough on May 26th 1624. Curiously the first recordings in London are almost exactly the same dates as in Linconshire, suggesting perhaps that the village was "cleared" of most if not quite all its inhabitants, perhaps to encourage sheep farming. This happened in many areas about this period of history. In London Thomas Haddington and his wife Dorothy were recorded at the church of St Thomas the Apostle, on August 28th 1624, whilst William Haddinton marrried BennetBeacham at Harrow on the Hill, on May 1st 1751.